Hexaphone 1.1.1 provides a unique "Motion Filter" - a Moog-inspired Resonant Lowpass Filter driven by your accelerometer. 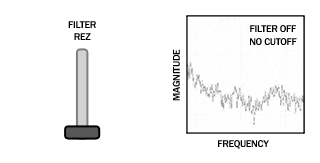 This filter amplifies a small part of the frequency spectrum, and "cuts off" all frequencies above that part of the spectrum. 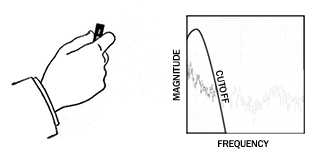 You can "sweep" the filter by moving the cutoff up and down - producing an effect similar to a wah-wah pedal. 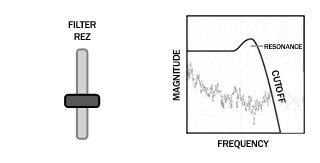 The position of the FILTER REZ slider effects the "resonance" of the filter - how much the frequency is amplified just before the cutoff. 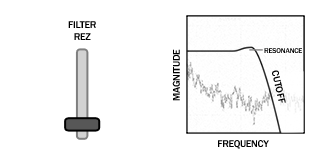 More resonance will make the filter sound "wetter". 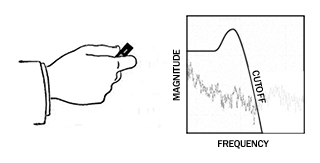 The filter will sound most interesting when it is in motion - even small movements up and down produce a noticable change in the sound. Not every patch sounds good with the filter - Tonewheel sounds especially bad, especially at the higher registers. 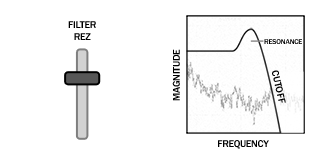 The filter sounds best with "edgy" sounds (with sharp wave edges), like Power Square, Power Saw and Bass Buzz. 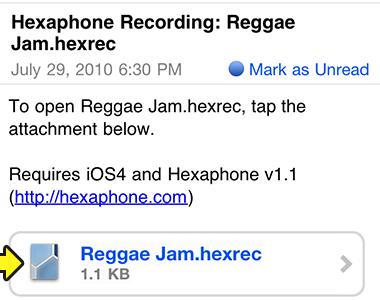 Hexaphone 1.1 leverages iOS4's file sharing features to make it easy to share your creations with others. First, create a recording in Hexaphone, tap the File icon (in the REC menu), and tap "Email Recording" in the pop-up. Next, enter an email address in the To: field, and tap Send. Your recipient will receive an email like the following. If they have Hexaphone installed, they'll see the Hexaphone icon, and be able to tap the attachment to open it. Unfortunately, opening the attachment shows you the raw data - tap "Open in Hexaphone" in the header to open the recording file in the Hexaphone app. The app will open, and your recording will play. Advanced users can access the files directly through iTunes. Connect your device to your iTunes computer, select it in the left navigation, click the "Apps" tab, and scroll down. You can select a recording and click "Save to..." to save the file on your computer. Or if you have a file you want to load onto your device, click "Add..." and browse to the file you want to add. If you post this link on the web, users who have Hexaphone installed can click on these links in Safari, and open the files directly in Hexaphone. If you make a recording you're particularly proud of, send it to recordings@hexaphone.com . If we like it, we may link to it on the website, include it in the app's Featured Recordings, or even publish it on YouTube. 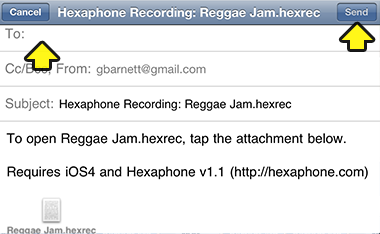 NOTE: This lesson uses the Reggae loop, one of the new loops in version 1.1 of Hexaphone, coming soon. This video demonstrates the use of the Minor Chord scale (called "Minor 2" in v1.0) to play a reggae jam. The Minor Chord scale, like a number of others (Major Chord, Trance, and Dance) form one triad on the top row, and another on the bottom. Thus, adjacent notes on the same horizontal row can always be played together, and will sound good. The distinctive reggae sound comes from chords played between each beat. 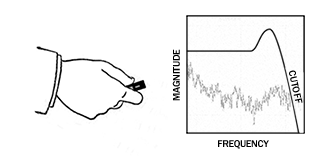 This technique is a subset of a more sophisticated reggae technique called "The Bubble". Hexaphone's simplified six-note keyboard makes it easy to play chords. This video demonstrates the use of the Minor Chord scale (called "Minor 2" in v1.0) to play dance chords over a bassline. In this scale, as well as the Major Chord scale (aka Major 2), Trance and Dance scale, all the notes on the bottom row form one chord, and all the notes on the top row form a different chord. Touching keys to the left or right will transpose these chords up or down. There are other chords you can make by combining keys from the top and bottom rows - these will be demonstrated in a future advanced lesson. Hexaphone works on iPad, too! Hexaphone was painstakingly designed to the form factor and dimensions of the iPhone and iPod Touch - so it's somewhat unexpected that it's really, really fun to play on the iPad! The graphics are a bit pixellated at 2x - it's an iPhone app after all - but the sound quality is perfect. If you're on Twitter, follow @hexaphonejam to receive updates, send feedback, or share Hexaphone info with your friends.